The ultimate of art adventures, the Venice Biennale has for 155 years been the premier art exhibition in the world. 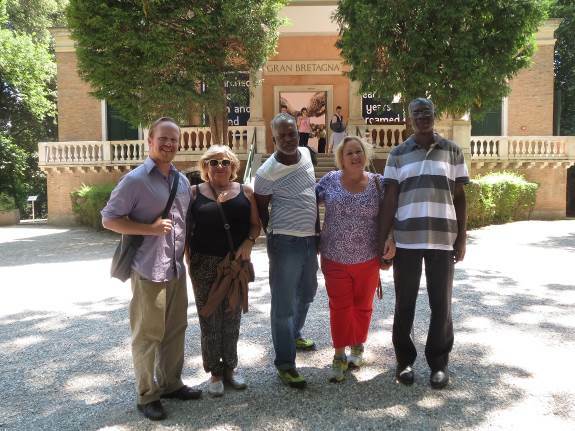 Grenada’s artists have not yet had the privilege of representing their country in art at this prestigious event, nonetheless, a contingent of Grenada’s leading artists found their way to Italy to be inspired by the works on display. Art and Soul Gallery at Spiceland Mall has been championing the cause of art for the past eleven years. As a real step of solidarity, and commitment to raising the standard of excellence in Grenada, several of the artists represented by the gallery joined in this “creative accrual” trip. Susan Mains, owner of the gallery, along with Asher Mains, Oliver Benoit, Maria McClafferty and Milton Williams, explored the halls of the Arsenal and the Country Pavilions together, with much discussion along the way. Most notable was the exhibit of the Bahamas, the only English Caribbean country with an exhibit there. A visually stunning display from Tavares Strachan, was supported by the Ministry of Tourism of the Bahamas. A graduate of the masters programme of Yale University in the United States, his combination of installations having to do with “Polar Eclipse” beg the question of what that has to do with the Bahamas. The bigger picture may be global warming, which is a very current concern of the low lying Bahamas, but then again it is completely open to interpretation which is the intent of the artist. The featured video in the Great Britain pavilion, a steel band in England provided the music and visuals—a recording being done at the famous Abbey Road studios of Beetles fame. Appropriation from the Caribbean is not new—it used to be cocoa and bananas, now it is our creative force. A previous presentation at the Biennale from Great Britain was a film of Steve McQueen, a Brit of Grenadian descent. Exhibits were diverse—sculptures, installations, videos, performance and many that blurred the traditional lines. There was a great number of works that had to do with the earth’s resources and how they are impacted by people. Some exhibits just left us shaking our heads. No need to name the countries. Just smh. The real question is when will Grenada be represented at such an esteemed event. Institutional support is a must. The invitation to participate only comes from government to government, so our Ministry of Culture, or Ministry of Tourism, or Ministry of Foreign Affairs must be involved. It is expensive. The work must be sent there, and the pavilion rented for six months. Support personnel must be there—another expense. And the printed material given to the visitors also is an expense. (Many countries also had private corporate sponsors). But the payback as far as exposure for Grenada is priceless. This is the world stage, just as much as the Olympics for sport. On the last night in Venice we opened and shared a bar of Grenada Chocolate that we had brought with us to toast the memory of Mott Green. He wanted to make confectionary chocolate in Grenada and was told that it couldn’t be done. While the “expert consultants” were telling him it couldn’t be done, he set his vision forward, overcoming many obstacles, and did it, creating one of the finest chocolates in the world. We hope that this same spirit of “can do” will propel us so that Grenada will one day be represented at the Biennale in Venice, and other world events for art. Just don’t tell us that it can’t be done.